Early one recent Sunday, a few hours before worship, a young man in a heavy camouflage coat and pants sat alone in the fellowship hall at Triune Mercy Center in Greenville, South Carolina. It wasn’t his first time at the church, but he hadn’t been there enough to know anyone well. Before long, a passing staff member stopped to give him a new pair of winter gloves and asked whether he could stick around to help clean up after the noon meal. And after worship and lunch, there he was, waiting quietly off to the side, ready to help as soon as the last diners finished eating. This is how Triune ministers, at once serving people and drawing them into the fold. In time, the newcomer may be like fellow worshippers Robert Shell and Charles K. “Hillbilly” Hester Jr. Like them, he may come to see Triune as family. But on that Sunday, he was like so many people who are homeless and find their way to the church. It’s an inescapable part of being homeless, said the Rev. Deb Richardson-Moore. “If there’s a common denominator, that’s it -- loss of every relationship,” she said. her 11th year as pastor. This is her 11th year as pastor at Triune, a nondenominational church near downtown Greenville, where the homeless, the affluent and those in between worship and serve together. 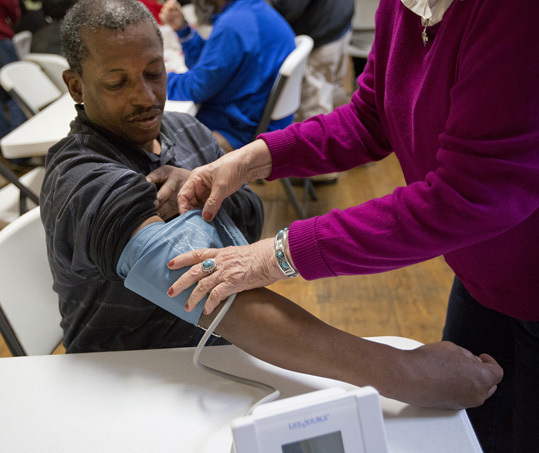 An independent nonprofit housed in a former United Methodist church building, Triune is known for the network of services it offers the poor. But its heartbeat is relationship: with Jesus, with pastors and staff, with other parishioners and with volunteers from the community. Whatever choices or struggles lead people into homelessness, they won’t be alone at Triune. Here, lawyers sit beside addicts, the rich beside the destitute. About a quarter of the congregation are people who are homeless, another quarter are working poor, and half are middle and upper class. They sing together, pray together and walk out talking together. In the season of Advent and Christmas, Triune is a vivid example of “incarnational ministry,” a hint of what Immanuel -- “God with us” -- might look like. Richardson-Moore came to the church straight out of seminary. A Greenville native, she was a reporter for The Greenville News for 27 years before sensing a call to the ministry. In her first months as a pastor, she questioned that call daily -- sometimes hourly. What does "incarnational ministry" mean to you? Incarnational ministry, she discovered, is messy stuff. She didn’t understand the people, and they were suspicious of her. She spent most of her time responding to an endless stream of strangers who were looking for food or clothes. She was spat on and lied to. In her 2012 memoir, “The Weight of Mercy: A Novice Pastor on the City Streets,” she wrote about being devastated by fights and disorganization and the presence and even sale of drugs at the church. 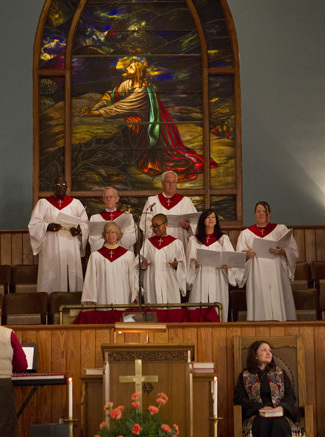 Associate Pastor Karen Eller listens to the Triune choir. The change came so gradually that it took her a while to realize she was no longer looking for an escape. Today, Triune draws not only people who are homeless but also lawyers, businesspeople and artists who come because they want to be part of what is happening there. Where is the gospel most vividly lived out in your church? James H. “Chip” Price III, a Greenville lawyer, first came as a volunteer offering free legal advice. Then he became a mentor in one of Triune’s support circles. And now he’s a church member, worshipping on Sundays alongside the people he serves during the week. Triune Mercy Center is first a place of worship, Richardson-Moore said. 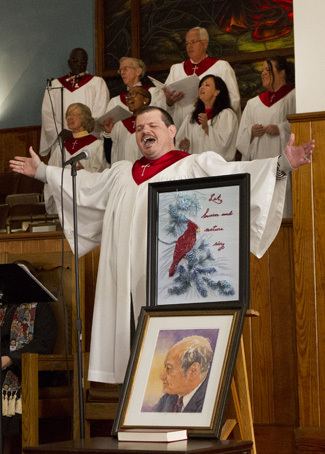 And on Sunday mornings in the sanctuary, that’s what it feels like, stained-glass windows, choir robes, sermon and all. The rest of the week, it’s a thriving hub of ministries, with many of the same people from the Sunday services side by side again -- some serving, some being served. 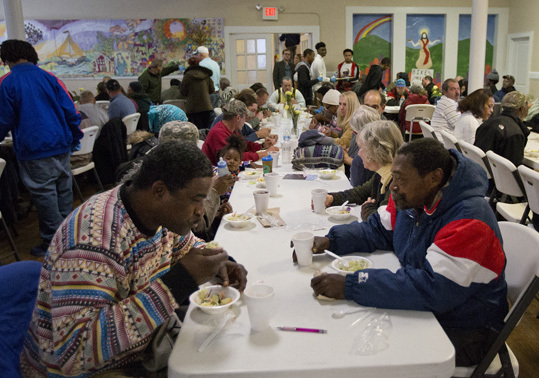 The church offers four hot meals a week and provides job counseling, housing assistance and more. 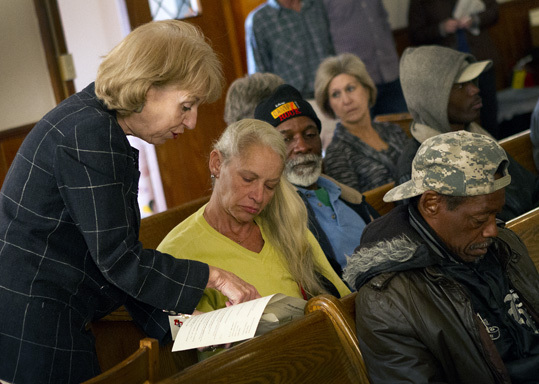 Homeless parishioners can do laundry, get legal advice or have a dental or eye exam. They can see a nurse, pick up groceries or have their bikes fixed. But those are just a beginning, not an end. Richardson-Moore wants to get to hearts. She and others work to identify the problems that bring desperate people to Triune. Often, they find addiction; other times, mental illness. Solutions depend first on a willingness to change. And they require an environment of trusting relationships, built over time. That’s the kind of connection Charles Hester has with Richardson-Moore and Karen Eller, the associate pastor at Triune. He said the two women rescued him. He’s been coming to Triune for two years. In that time, he’s been in and out of housing, including stints in Greenville’s infamous “Tent City” -- a homeless encampment the city shut down last year -- and has struggled on and off with alcohol. 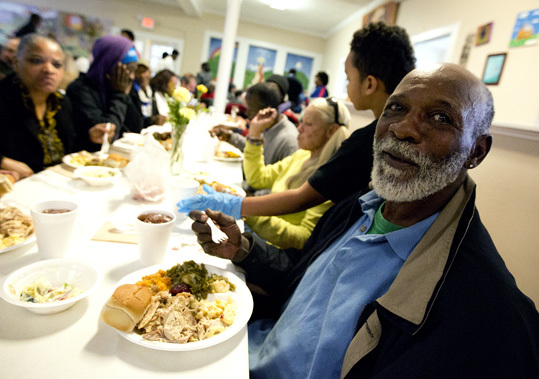 He quit drinking again about three months ago and now lives at the Greenville Rescue Mission. A fixture in Triune’s art room, Hester now focuses on painting, and hopes to sell enough pieces to pay his bills. He does landscapes and portraits, subjects from real life and from his head -- like a new piece with Jesus wrapping his arms around an addict, bottles and paraphernalia scattered on the ground. Not long ago, he sold three paintings in a week. Pulling out a flip phone, he clicked through the pictures to find his portrait of Chip Price. “My lawyer,” Hester said, as the image -- a remarkable likeness -- appeared on the screen. Hester has high praise for the church and its pastor. “She honestly cares about homeless people,” he said. Robert Shell was among those ranks until three years ago, when he got into his own house with Triune’s help. Every Tuesday, he cleans it right down to the baseboards. He loves the place. And he loves the church, where he’s formed relationships not just with staff but also with parishioners and volunteers. Shell and Carey Lee Hudson, a local painter, met in the art room, where Hudson has been volunteering for a little more than a year. In conversation, they discovered that years ago Shell’s grandfather worked for Hudson’s husband’s grandfather in a Greenville tire store. For both, it was like finding a lost family member. Now Hudson’s four children call Shell “Uncle Robert,” and he talks about cheering for “my nephew” at her son’s football games. Last month, Hudson invited Shell to her house the day after Thanksgiving to help eat leftovers. Before coming to Triune, Hudson used to work her way through a popular Bible study every year. In recent years, though, it had started to feel stale. “This is where I have come to experience God, instead of reading about it in a book,” she said. 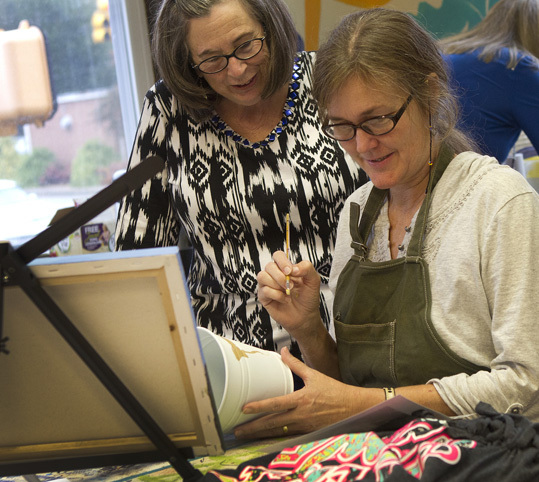 Art room director Marian Dameier consults with artist Christina Burrall-Thompson. The art room is part of a full-scale arts ministry that also includes a music room and a performance cafe. It’s hard to envision another place where Shell and Hudson would have met and connected. But Triune is a place where class and race and housing status fade. How well does your church break down traditional barriers such as class, race and economic status? 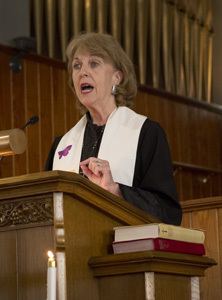 People’s stories get all mixed up together, said Judy Olson, another volunteer who made Triune her church. Addiction is a theme in many of the stories. Triune has ways to help, but people have to want that help, said David Gay, the church’s rehabilitation specialist. Gay places about 100 people into treatment each year -- nearly 1,000 so far in his tenure at Triune. “We do what we can to get them in there -- if they’re serious,” he said. Sometimes the motivation comes and goes. Recently, Richardson-Moore has been trying to figure out how to deal with a member who has been serving in the church but now seems to be back on drugs. Should she let the member keep serving, so he or she can still hear the gospel and be challenged to change? Or put her foot down? “I guess I feel like the alternative -- ‘Don’t come in here’ -- is worse,” she said. The Sunday fellowship lunch is one of four hot meals Triune Mercy Center serves every week. It’s a constant balancing act, “to provide hospitality without enabling addiction,” she said. Her understanding of this balance has developed over the last decade. In the beginning, Triune practiced mostly open-ended, no-strings giving. But then Richardson-Moore began to learn that gifts -- such as clothes from a free closet -- can sometimes be currency to feed addiction. She saw that taking care of physical needs without addressing heart needs wouldn’t lead to meaningful change. Over time, Richardson-Moore said, the church became believers in the notion of “toxic charity” -- the idea that people can be harmed when their needs are provided. The ministry is more thoughtful now. It doesn’t have an endless supply of food for someone who isn’t working or trying to work. And while no one is ever turned away from worship, those who fight or break other rules can get a 30-day suspension from the art room, meals and other opportunities. Richardson-Moore knows that many people who come to Triune are looking, at least initially, for groceries or a coat, medical care or a few minutes of warmth. The Rev. Deb Richardson-Moore asks Venetta Pittman to lead the morning's responsive reading. “But they’re met with real-life transformational possibilities,” she said. Even so, Richardson-Moore is circumspect. Hope and the possibility of transformation are real. But being pastor at Triune sometimes also requires being police officer, detective and parent. “Sometimes it looks better on the outside than it is,” she said. In 10 years of volunteering at Triune, Sallie Eskew has learned to listen with one ear attuned to people’s stories and one ear to God. “God just kind of speaks to you and tells you, ‘Yes, you need to help this person,’” Eskew said. She loves Wednesdays -- among the busiest days of the week at Triune -- when she can be face to face with folks whom other people may look through and never see. The day starts with a literal prayer circle linking everyone hand in hand around the room. Then, people who have signed up for groceries wait their turn to meet with an intake manager. Staff and volunteers listen to life stories and help identify possible resources at Triune or elsewhere in the community. The room is swarming as people write cards home, have their blood pressure checked or wait to meet with a lawyer. No one wears a name tag. By design, nothing distinguishes staff from volunteer, church family from community help. Triune offers health care services, including blood pressure checks, vision screens and dental checkups. Triune has 11 full- and part-time staff members. Between 80 and 100 people, from Triune and beyond, regularly volunteer at the church. Another 1,500 from partner churches help prepare and serve the four hot meals offered every week. “We try to level the playing field, making everyone equal and valued,” Richardson-Moore said. The same philosophy extends to small group meetings such as the twice-weekly roundtables and the support circle program. 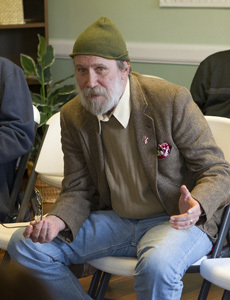 Donnie Johnson enjoys the congregational lunch that follows each week's worship. At the roundtables, people in the process of recovery meet with social workers. At one recent meeting, social worker Robin Barton asked for a full account of each person’s situation, from education to housing, mental health to addiction. Then she and the other participants -- from staff to homeless parishioners -- offered suggestions and praised those taking action. Barton said participants who attend regularly are more likely to reach their goals, and to do so more quickly. In the support circles, a person who is working to make changes is surrounded by four or five supporters who serve as mentors, teachers and encouragers. The groups meet weekly for a year. About half the participants drop out, which is typical for such programs. But those who finish tend to gain stability and the positive, supportive relationships they’ve often been missing. Jackie Godfrey graduated from her support circle in March 2014, but the group still meets monthly in each other’s homes. Triune doesn’t just support people who are poor or homeless. It offers purpose and dignity by treating them like any other church member. “This is also your church, so you come here and work too,” Richardson-Moore said. Each Sunday morning, she handpicks a parishioner to lead the responsive reading. Another staff member chooses ushers. Because nobody knows who will show up week to week, the church doesn’t have a prearranged schedule of who serves in worship. But Richardson-Moore wants the faces leading and serving to reflect the breadth of Triune’s family. Who are the faces of your church on Sunday? Who is missing? But, she said, her friends and her church family are now her support system. Triune offers the hope of ongoing relationships through the ups and downs of recovery. “Even when they fail again, there’s still a community here for them,” Richardson-Moore said. Eskew, the longtime volunteer, marvels at how far the church has come in the past decade. She remembers the general sense of hopelessness back when Richardson-Moore was new to the ministry. But she’s seen God bless and build a family out of an unlikely group. Bad behavior is no longer tolerated. “If something happened now, about 20 guys would stand up and say, ‘We don’t act like that in our church,’” Richardson-Moore said. Because no matter where they’re sleeping that night, whether they came for help or to be of help, they’re in it together. What draws people to your church? Do people in the community see the gospel being lived out in your church? In what specific ways? What can your church do to break down traditional social barriers such as class, race and economic status? What are people looking for when they come to your church? To what extent does it offer the possibility of real-life transformation? What is your church's "face" on Sunday morning? Who leads and serves in worship? Who is missing?